He takes after his father and his grandmother this way. And our daughter? Well, let’s just say that apple didn’t fall very far from the tree. I’ve always known she was stubborn, but last night, she let us know just how stubborn she could be. After waking up from her nap, Rylee decided she’d like a snack. She said cheese and crackers sounded pretty good, and Andy thought so too so he got a snack for both of them. He put some sliced up cheese and a pile of ritz crackers on a plate, then handed Ry a paper towel so she could grab what she’d like. She took a few crackers and one piece of cheese. She took one tiny bite of the cheese and set it back on her paper towel, then preceded to eat all of her crackers and tell us she was done. Uhhh…no you’re not. You love cheese. You chose to take a piece, you need to eat it. Rylee you will eat that piece of cheese before you get anything else. You can choose to eat it now, while it’s still good or you can choose to eat it before dinner, but it won’t taste as good. And so, there it sat on the paper towel. A couple of hours passed and soon it was time to set the table for dinner. One of Rylee’s favorite dinners, by the way…roasted chicken, green beans, and fetuccini alfredo pasta. 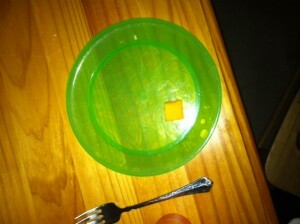 The lonely piece of cheese moved from the paper towel to her dinner plate. Andy was not letting up on this one. And I get it, her eating habits have been horrible lately, saying she wants one thing, then not wanting it 5 minutes later. And things she LOVES too. Frankly, it’s getting old. Rylee sat there with nothing on her plate but that little bit of cheese until Andy & I were nearly done eating before she finally decided that she wasn’t going to win this one. She ate choked down the cheese and any 3.5 year old drama queen would do and preceded to eat a fantastic dinner. This entry was posted in Discipline, food, growing up, montser on January 30, 2012 by katherine. Bwhahahahahaha. THIS! We get into that "I want juice". Get out said juice ready to pour. NOT THAT JUICE. That is the only juice we have. ::whine whine stomp stomp:: "Well you drink this juice or nothing." "NO" "Ok I am putting the juice away" "NO I WANT JUICE" "Are you going to drink it?" "Yeah ::pouty voice::. WTF?? She doesn't just get her stubborn streak from her father. Katherine you are stubborn in your own way. The combination of the two produced a little red haired girl who is extreemly stubborn and I love it.